#10: Can Clemson repeat as national champions? “Clemsoning” is a thing of the past as the Tigers are reigning national champions and primed for a potential repeat as the preseason No. 5 team in the country. The defense is stacked and the offense is full of young talent. All eyes will be on QB Kelly Bryant to see how well he can fill Deshaun Watson’s enormous shoes. #9: Which Group of 5 team will make a New Year’s Six bowl? Last year Western Michigan rowed the boat all the way to the Cotton Bowl. This year all signs are pointing toward USF. That’s right, the USF Bulls and new head coach Charlie Strong have a loaded roster and Charmin-soft schedule that makes an undefeated season a real possibility. #8: Can Ed Orgeron return LSU to powerhouse status? Who doesn’t love Coach O, who resembles Farmer Fran from “The Waterboy”? Orgeron adds some much-needed Cajun flavoring to the SEC and college football as a whole. The question is whether Coach O can get LSU back to winning national titles with Nick Saban and Alabama standing in his path. #7: Will USC finally live up to the preseason hype? It feels like USC starts every season in the Top 10 only to underachieve. This year feels different with the Trojans ranked No. 4 in the preseason, coming off a Rose Bowl victory and led by Golden Boy QB Sam Darnold. We will find out soon as USC hosts Stanford and Texas in Weeks 2 and 3. #6: Can Lamar Jackson become the 2nd player to win two Heisman Trophies? Which Lamar Jackson will we see more of in 2017: The one who skyrocketed to college football superstardom in the first 10 games of last season, or the QB who struggled mightily in three straight losses to close out 2016? If it’s the former, this could finally be the year someone joins Ohio State’s Archie Griffin as the second player to win two Heisman Trophy awards. But the odds, and history, are against it. #5: Is Tom Herman vs. Lincoln Riley the next great coaching rivalry? Arch-rivals Oklahoma and Texas are both breaking in new coaches. Tom Herman, 42, was the splashiest hire of the offseason but then Lincoln Riley, 33, went and stole the spotlight after the shocking retirement of Bob Stoops. If everything goes according to plan, they could be facing each other for decades to come. #4: Is this Brian Kelly’s last season at Notre Dame? There are plenty of big-name head coaches on the hot seat (Kevin Sumlin, Butch Jones and Jim L. Mora, to name a few) but no one is under more pressure than Brian Kelly. Neither deflecting blame onto his players nor a monster buyout will be enough to save Kelly’s job if he follows up last season’s 4-8 dud with another dud. #3: Is the SEC still the king of college football? 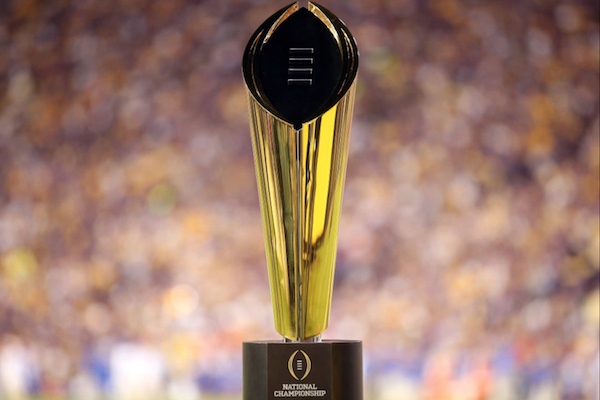 The SEC has long reigned over college football with eight of the last 11 national titles. But the ACC is home to the defending national champion. The Big 10 has four preseason Top 10 teams I the Coaches Poll. And the Pac-12 is on the rise. Needless to say, there are plenty of bragging rights on the line this season. The NFL pre-draft hype train for USC’s Sam Darnold, Wyoming’s Josh Allen and UCLA’s Josh Rosen is full steam ahead, as all three are widely predicted to be Top 10 picks next spring. Plenty of others (i.e. Jackson, Baker Mayfield, J.T. Barrett, Jake Browning, Jalen Hurts, Deondre Francois) are in the running for the Heisman Trophy. Yes, there’s no shortage of top-notch signal-callers this fall. #1: Will Alabama roll to its 4th straight College Football Playoff? Alabama is starting the season ranked No. 1. Again. The Tide is gunning for its fourth straight College Football Playoff and Nick Saban’s fifth national title to tie him with Bear Bryant. Alabama’s schedule is absolute murder but everyone expects the Tide to start and finish their season in Atlanta, because that is the bar Saban has set.